The Future of Food distills the complex technology and consumer issues surrounding major changes in the food system today -- genetically engineered foods, patenting, and the corporatization of food -- into terms the average person can understand. 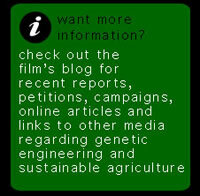 It empowers consumers to realize the consequences of their food choices on our future. Ask about showing the film in a theater near you using Tugg.